The eleventh Éigse Michael Hartnett arts and literary festival takes place in Newcastle West from 22 to 24 April. The line-up is impressive for a short festival, including poetry readings, lectures, puppet and music shows (brochure available here). Special guests include Jorie Graham, Fintan O’Toole and Mark Patrick Hederman. Micheal Hartnett was the poet laureate of the area, born in Croom and raised in Newcastle. Newcastle West Community Council have, in advance of the festival this year, commissioned a public sculpture to commemorate Michael, for display in Newcastle. 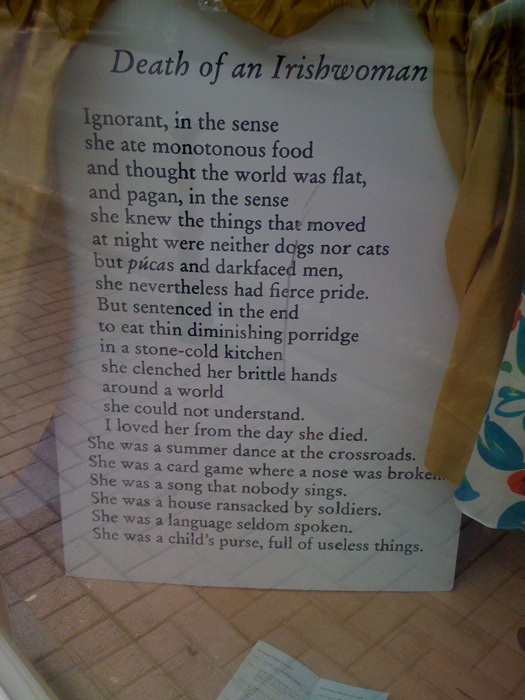 Local businesses are running a literary trail, displaying some of his works in their shop windows. This example is Death of an Irishwoman, written for his grandmother Bridget Halpin. The ash plume caused by the Eyjafjallajökull eruptions has caused changes to the programme – see the website for updates. On Sunday morning I noticed, for the first time, the below plaques on AIB’s Newcastle West branch. 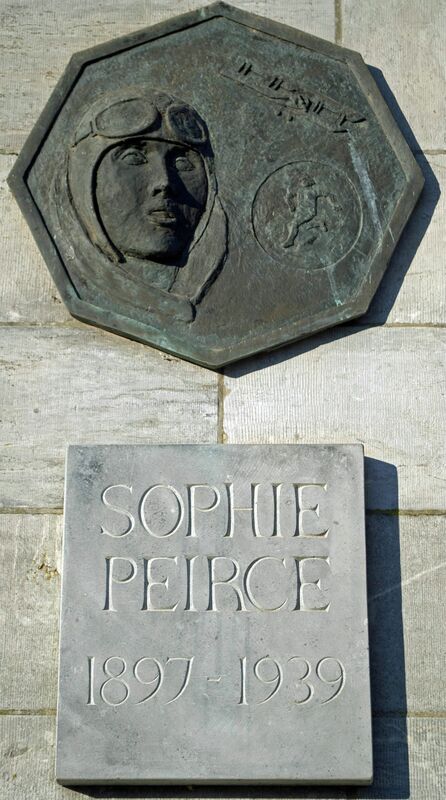 They commemorate Sophie Peirce, known in later life as Lady Heath and nicknamed Lady Icarus. Sophie was born in Knockaderry House, a few miles outside Newcastle West. She appears to have spent some of her early youth in Dublin until the untimely death of her mother at the hands of her father, who was sent to the then Dundrum Mental Asylum For The Criminally Insane, resulting in Sophie’s return to West Limerick. At the time of the 1911 census, she was living with her grandfather at 16 the Square, Newcastle West. As noted in this book review of From Sophie to Sonia: A history of women’s athletics, the record-setting, parachute-jumping aviator is little known in Ireland. She went to England early in the First World War and served as despatch rider with the Royal Flying Corps. She was married and divorced three times and achieved prominence in varied fields. Sophie, then Mrs. Elliott Lynn, started her athletics career in 1921, and set a world record for the high jump of 4 ft. 10½ in. (1:48 metres). She represented Britain in two Women’s world Games, coming 4th in the javelin. Sophie became involved in athletics administration on the formation of the women’s A.A.A. in 1922, and wrote a seminal coaching manual “Athletics for Women and Girls” in 1925 … Sophie later became a pioneer aviator, made the first solo flight from Cape Town to London and became a pilot with K.L.M. Sadly, she died in a road accident in London in 1939, aged 42. RedMum wrote about Sophie in late 2006 as part of a series of blog posts on great Irish women, adding to the impression of her as an eccentric maverick in the Roaring Twenties mould. Her epic trip from Cape Town to London was made with a Bible, a shotgun, a couple of tennis rackets, six teagowns and a fur coat, in a time when men flew with boiled eggs and ham sandwiches. She even had her portrait painted by Sir John Lavery. 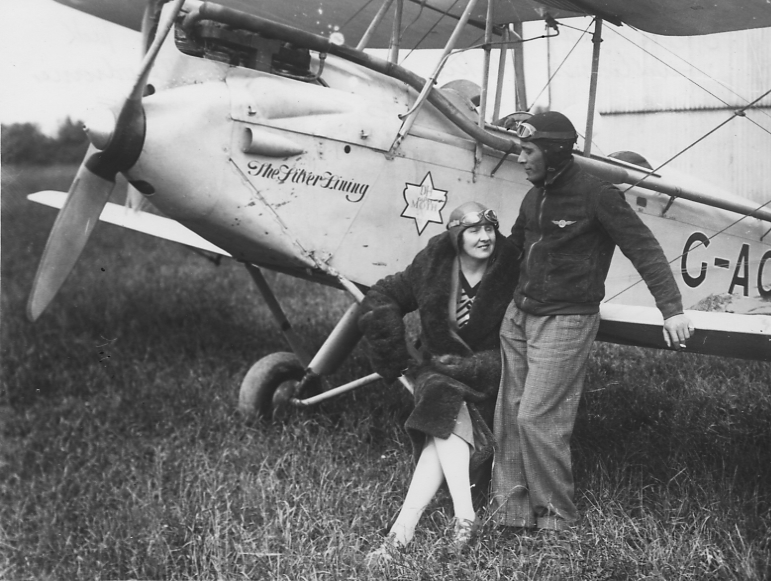 Amelia Earhart gets most of the aviatrix attention but with her movie getting bad reviews, there may be a market for a biopic of Lady Icarus and her exploits. The Lady Icarus blog which includes some old footage and documentary excerpts. Lady Icarus: The Life of Irish Aviator Lady Mary Heath, by Lindie Naughton, “an absorbing tale of murder, romance and full throttled adventure”, is available from Ashfield Press. Photo of Lady Heath with The Silver Lining (a de Havilland DH.60 Moth).